Wes Anderson's 1998 comedy is getting the Criterion Blu-ray treatment in November. 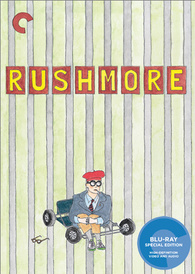 In an early announcement to retailers, the Criterion Collection will bring 'Rushmore' to Blu-ray on November 22. Tenth grader Max Fischer (Jason Schwartzman) is Rushmore Academy’s most extracurricular student, and its least scholarly, in Wes Anderson’s dazzling sophomore effort—equal parts coming-of-age story, French New Wave homage, and screwball comedy. The Blu-ray will feature a new 1080p digital transfer, a DTS-HD Master Audio 5.1 soundtrack, and supplements include: Audio commentary by Anderson, cowriter Owen Wilson, and actor Jason Schwartzman; The Making of “Rushmore,” an exclusive behind-the-scenes documentary by Eric Chase Anderson; Max Fischer Players Present: Theatrical “adaptations” of Armageddon, Out of Sight, and The Truman Show, staged for the 1999 MTV Movie Awards; Episode of The Charlie Rose Show featuring Anderson and actor Bill Murray; Cast audition footage; Wes Anderson’s hand-drawn storyboards, plus a film-to-storyboard comparison; Props, posters, behind-the-scenes photos, and other graphic ephemera; Original theatrical trailer; Collectible poster; and a booklet featuring an essay by film critic Dave Kehr. You can find the latest specs for 'Rushmore' linked from our Blu-ray Release Schedule, where it's indexed under November 22.